GLASGOW PRESTWICK AIRPORT in Ayrshire recorded month-on-month and year-on-year hikes in its passenger performance during the month of June. The results were announced as the airport gears up to handle around 35,000 passengers over the Glasgow Fair weekend. A total of 222,940 passengers used the airport in June – this is 3% up on June 2007 and 1% up on May, when the airport also recorded similar improvements. 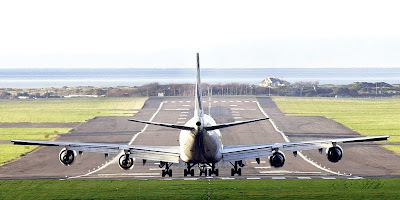 Glasgow Prestwick Airport chief executive Mark Rodwell said: “This is a strong showing in the current aviation environment and demonstrates how individual airports and airlines can grow against a declining trend. “The overall Glasgow market is declining, demonstrated by the fact that passengers at Glasgow Abbotsinch were down by 4.9% in June, consistent with its year-to-date drop of 4.8%. The major factor in June’s positive year-on-year variance is a 36% rise in the number of charter passengers against a 1% rise in scheduled passengers. Glasgow Prestwick Airport’s main charter operator Seguro Holidays has increased capacity this year by using larger aircraft. This result is also counter-cyclical given a drop of 4.7% in European charter passengers across BAA’s UK network. The year-to-date (April 1 – June 30) total of 643,269 passengers is 1% higher than it was in the equivalent period last year and the airport also recorded its busiest ever day on Friday 27 June, handling more than 10,000 passengers. There are currently 298 Ayrshire business stories permanently archived on this site. To locate those of most interest to you, please use the site search facility in the top left hand corner of this page. Type your search term in the white box, then click “SEARCH BLOG”.